Pressure cookers are a superb way to cook delicious, nutritious and healthy food...fast. I designed this website to help you find the best pressure cooker for your budget, lifestyle and overall needs. Not all pressure cookers were created equal and it can be confusing to know which one is right for you. Don’t just go for the best rated model – find the right one for your needs. In this buyer's guide, we run through what to look for when buying a pressure a cooker, with some useful tips on what you should look out for. Once you’ve read this guide, you will know exactly what to look for when reading pressure cooker reviews. In the chart below, you will find what I believe to be the top pressure cookers on the market. If you click on the "Our Review" link, you will be taken to a detailed review of each model. Before you buy, it is important to know what kind of pressure cooker fits your needs in terms of your cooking and lifestyle. A great starting point is to decide on the type that you want. Then ascertain the functions each model offers and how they match with your cooking style. You can then narrow down specific brands and models. After reviewing dozens of different brands and models, we have put together a comparison chart which easily helps you to distinguish which pressure cooker is going to be the best for you. Each model has been graded and given an overall score out of 5. We have also searched for the best price and linked accordingly. Electric pressure cookers (sometimes referred to as digital pressure cookers) offer several pre-set pressure settings, whereas the traditional version has to be controlled manually by the stove. This means that electric pressure cookers are easier to use and more flexible in what you can cook as they can be used for slow cooking and steaming. The pre-set programs often include poultry, meat, fish, rice, soup and more. They also tend to be safer than the traditional type and can be used anywhere in the kitchen. The electric pressure cooker is starting to supersede stove top cookers. That said, before you rush out to buy one, keep in mind that the traditional type can represent simplicity and affordability. A stove top can also be used as a cooking pot, making them the ideal choice for some people. Most people would consider the ideal pressure cooker to be electric and a lot of customer ratings agree. But consider what you need before you commit: affordability and simplicity or a wide range of settings and ease of use? Aluminium and stainless steel are used to make pressure cookers, but which is the best? Pressure cookers come in two materials: aluminium and stainless steel. Steel is undoubtedly the preferred option because it is more durable than aluminium and tends to look more stylish. However, this durability comes at a greater cost. If your budget is limited, start looking at the aluminium cookers – there is no reason why an aluminium option can’t be ideal for you – after all it is a great conductor of heat and is lightweight. But if money is not an issue, buy stainless steel for the best quality. Stainless steel is hard-wearing and because this metal reacts less with foods, it will see significantly less corrosion and wear and tear. If long life and durability is your priority, stainless steel is the way to go. Do be warned though, stainless steel can be heavy. This may be an issue if you opt for a larger stove top pressure cooker. If you are shopping for a commercial pressure cooker, you definitely want to go with stainless steel. Aluminium is cheaper while stainless steel is more expensive. There’s no right or wrong option, but stainless steel is better quality and will last longer. If you plan on using your pressure cooker regularly, we would recommend stainless steel. There are a variety of brands and models available so shop around. Pick a brand you know and trust. It might be tempting to find a cheap option from a little known brand but remember that electric pressure cookers may need replacement parts over time. If this happens, you need a reputable and reliable company. Once you identify a couple of brands, look at specific models and look at the features with a critical eye to see if they fulfill your requirements. This will help ensure that you get the right pressure cooker for you. Some popular brands are listed below. This list isn’t meant to be exhaustive but should provide a good starting point to identify high quality brands and models. All are chosen for their top reviews and popularity with customers. 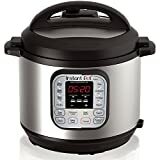 Instant Pot – This is one of the most popular brands boasting some of the highest reviews online. Top quality options include the IP-LUX-﻿60 and the much loved and high end IP-DUO60 (which is the one that I recommend). Kuhn Rikon - This Swiss brand tends to be more reasonably priced than many others and boasts some stylish European design. Their top rated pressure cookers include the Duromatic Inox and the Hotel ranges. Fagor – This is a reputable Spanish brand featuring a wide range of options covering all budgets. Among their most popular offerings is the stove top Duo line. All American – This is a classic American brand with a more industrial focus allowing greater quantities to be cooked. Strength and durability set this brand apart. The 921 is a top rated model – be aware, though, that this brand is for bigger budgets. Secura – Many online people have revealed this brand to offer solid construction at affordable prices, even if the electronics are not quite as sophisticated as other brands. MaxiMatic – With slightly different styling to other brands, MaxiMatic offer high quality pressure cookers, most notably the EPC-807. The above provides a starting point to begin narrowing down the correct pressure cooker for you. These brands have a reputation for quality and reliability. Leading industry favorites are Cuisinart, All American and Instant Pot but all these are worth considering. Check out other reviews to see if others people's experience is positive. Warranties can differ enormously depending on the brand and model so choose wisely. If you stick to a well known brand like the ones we recommend it is unlikely that your pressure cooker will break. But, as we all know, things can and do go wrong. When kitchen appliances break, through no reasonable fault of your own, you want the manufacturer to replace it or repair it. The pressure cookers available on the market offer a very wide range of warranties from 1 year to 10 years. Remember that a longer warranty is a sign of quality and means you won’t have to worry about getting your pressure cooker repaired or replaced. As a rule, any pressure cooker with less than 1 year’s warranty should be avoided. Choosing the right size is important because the capacity of pressure cookers can vary significantly. If you are doing research by looking at pressure cooker reviews, remember that they come in a range of sizes but the standard sizes are 4 quart, 6 quart and 8 quart. There are larger options available, even up to 23 quart, but these are intended for professional kitchens rather than home cooking. It is worth spending time considering the different sizes because there is no need to buy a larger cooker than you need, given that it can cost more and take up more space. 4 quart - This size is ideal for single people or couples who do no need to cook multiple portions. Fairly small. 6 quart – This is the most popular size and is regarded as the standard size for families. It should be able to handle several portions. 8 quart – This is the best choice for large families or if you plan on entertaining multiple guests. 10 quart - 10 quart and above tends to be for professionals cooking for large quantities of people. A professional kitchen or catering company may use one this size. Cookers of this size are also used for preserving food. Bear in mind that 6 quart is the standard size and fits most peoples’ requirements adequately. If in doubt, it doesn’t hurt to buy a size slightly larger so you’re sure to cover all your needs. When reviewing models, all the different features can be confusing. Here are some tips that will make reading reviews easier. This may not seem important but a pressure cooker should have handles to make it easy to lift. This means handles that do not conduct heat – the last thing you want is to burn your hands. This is especially important for stove top cookers that need to be moved on and off very hot stoves. Remember that pressure cookers, once filled with water, can be very heavy. When looking for a pressure cooker, non-stick sounds like a great idea. After all, it works well for pans. However, given the nature of the cooking and prolonged use of pressure cookers, the non-stick surface degrades and can peel off. The intense pressure means that the non-stick material cannot survive as long as it does on a normal pan. This can get into the food. While it may not be particularly harmful, it is certainly not something you want to be eating. ​All the best pressure cookers should have a clear and easy to read pressure indicator. In order to follow recipes correctly, you need to gauge the pressure accurately. This also ties into safety – the indicator will tell you when pressure is too high, letting you know when it’s time to release it. The safest pressure cookers all have reliable pressure gauges. ​This feature allows pressure to be released while maintaining heat. It allows the lid to be opened by decreasing this temperature to a manageable level. ​You can cook anything (within reason) with a pressure cooker but an electronic program can make it easier. Consider models that offer a variety of pre-set programs that enable you to simply select a food type (like fish, for example), press a button and it is done for you. Some models will cater for poultry, meat, beans, chilli, porridge, rice and more. Some programs are easier to use than others. Check our electric pressure cooker reviews to see if they are easy and intuitive. ​Needless to say, a dishwasher safe pressure cooker is ideal and many of them can go straight into the dishwasher after use. Cleaning pressure cookers by hand can be tedious and in some cases, quite difficult, depending on the model. This detail is often missed out by pressure cooker reviews so always look out for “dishwasher safe” in the product description. Safety is very important when it comes to all kitchen appliance and pressure cookers are no exception. Whether they are the traditional stove top type or electric, they should have a cover interlock mechanism to safely control the pressure. This is a safety system designed to prohibit pressurization until the lid is securely closed. This is because pressurized steam can be highly dangerous and need to be correctly managed. Steam can cause serious burns. All pressure cookers should have this feature as standard. If it doesn’t, avoid it. Electric pressure cookers should control this automatically. This isn’t just a feature of the best pressure cookers – it should be a given. ​It is important to know that different models of pressure cooker can have different pressure capabilities. In order to cook the food at a certain temperature, a certain pressure has to be reached. Bear in mind that most recipes require 15 pounds of pressure – anything less will give disappointing results. Pressure cookers tend to come with a setting of 15, and others will offer a variety, including 5, 10 and 15. The greater the range of pressure, the more options you have to cater for different styles of cooking. Make sure that the pressure cooker you choose is capable of delivering of 15 pounds of pressure. Other pressure settings on top of this are a bonus. The better pressure cookers offer a range of settings. Many pressure cookers come complete with racks and baskets which enable you to separate different food in the same pressure cooker. This allows you to cook different things at the same time which can be a very useful time saving device. A pressure cooker like this can be used to prepare the majority of the meal. ​When looking at stove top pressure cookers, it is very important to know whether it will work on your type of stove. Most should work on all heat surfaces but it is always worth making sure. Do you have a gas stove, induction cooker or electric? Always check that the pressure cooker you buy is compatible. It doesn’t matter if you buy the best pressure cooker on the market if it doesn’t work on your stove. ​Pressure cookers, whether they are stove top or electric, are complex appliances with different features and parts that need to be understood. Read the above carefully to get a thorough understanding before buying. In our opinion, the Instant Pot IP-DUO60 is the top pressure cooker on the market. It offers the best combination of features, quality and affordability. 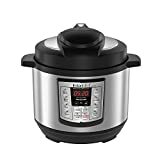 The Instant Pot IP-DUO60 is an advanced pressure cooker that contains all of the latest bells and whistles. It is sleek, and comes from a brand that you know you can trust. Definitely one of our favorite canners! Pressure cookers are enjoying a resurgence among younger cooks who see the potential for a variety of cooking styles. They are great for cooking food quickly. Because the pressure allows food to heat up a lot faster, your food is cooked quicker. They are economical. Sure, the cooker isn’t extremely cheap but in the long run, they can really save you money. This is because pressure cookers are fantastic for cooking cheaper cuts of meat. Because cooking times are reduced by up to 70%, you should see a reduction in your electricity bill. Shorter cooking times also mean it’s an environmentally friendly way to cook. Pressure cookers allow food to retain their nutrients better, making dishes prepared with pressure cookers healthier and more nutritious. It’s easy. Pressure cookers, especially electric ones with pre-set programs, allow delicious home cooking without the fuss. Old fashioned pressure cookers were a kitchen staple for many decades. They fell out of favor, however, because they weren’t deemed to be as safe as they should have been. Fortunately this concern is no longer relevant, with today’s models enjoying better safety features. Pressure cookers remove the need for a variety of pans on the stove meaning that there is less mess to clean up. This makes pressure cookers an ideal time saving device for busy people. Pressures cookers can also be used for preserving food. This is why they are sometimes called “canners”. The bottom line is that the faster cooking times associated with the better pressure cookers have a variety of benefits for the environment and for your health. Pressures cookers also give you the flexibility to cook a variety of delicious meals. We hope this guide has helped prepare you for finding the best pressure cooker for your kitchen. It is not meant to be exhaustive, but a general guide to aid in making an informed decision. 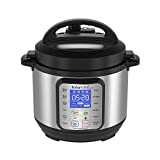 We have avoided giving specific pressure cooker reviews in this guide because we think it is important to understand the features of pressure cookers so you can make your own decision. This will help in finding one that is perfect for your own needs. We encourage you to look at reviews to make sure the product is high quality, but it is not always wise to follow ratings alone. Happy pressure cooking! Infographic about why pressure cookers are awesome! For more information about pressure cookers, Wikipedia is a great resource too! "Thanks Elizabeth! Your site saved me so much time and money! If you are looking for a pressure cooker, you've come to the right place!" "When I started to look for a new pressure cooker, I was completely overwhelmed with all of the choices out there. Elizabeth from Pressure Cooker Pros helped me make an informed decision. I love my new pressure cooker!" 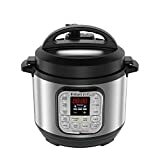 "Pressure Cooker Pros is THE resource when searching for a pressure cooker. Their reviews and expert information is invaluable"
Pressure Cooker Pros Gets 5 out of 5 Stars Based on 3 Reviews from Our Readers!